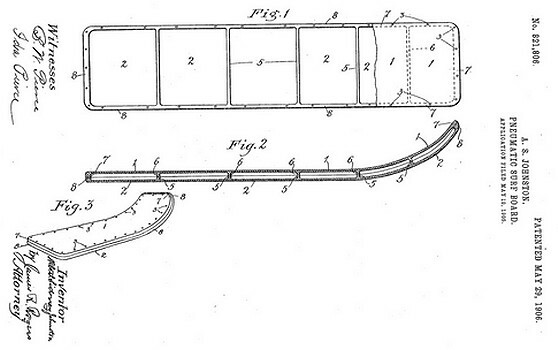 Albert S.Johnston : Pneumatic Surf-Board Patent, 1906. US Patent Office Serial No. 261,206. 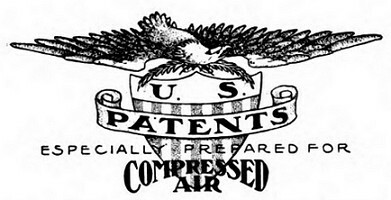 Patented May 29, 1906. Application filed May 19, 1905. Volume 11 Number 6, August 1906. A. S. JOHNSTON : PNEUMATIC SURF BOARD. APPLICATION FILED MAY 19. 1905. ALBERT SIDNEY JOHNSTON, OF LOS ANGELES, CALIFORNIA. Application filed May 19, 1905. Serial No. 261,206. Beit known that I, ALBERT SIDNEY JOHNSTON, a citizen of the United States, residing at Los Angeles, county of Los Angeles, State of California, have invented and discovered a new and useful Improvement in Pneumatic Surf-Boards and I do hereby declare the following to be a full, clear, and exact description of the invention, such as will enable others skilled in the art to which it appertains to make and use-the same. This invention relates to improvements in the manufacture of pneumatic surf-boards; and the objects of my improvement are, first, to economically provide pneumatic surfboards that when continuously used for a long time will not absorb water, and thereby increase in weight, and, second, to construct surf-boards that after having been for a long time in use are still buoyant, require little time to dry them and restore the same to their original condition. The invention consists, essentially, in the construction, arrangement, and combination of parts, as hereinafter described, shown upon the drawings, and specifically pointed out in the claims. Fig. 2 is a longitudinal sectional view of my invention. Fig. 3 is a perspective view of the completed board ready for use. Similar reference-numerals refer to like parts throughout the several views of the drawings. The reference-numeral l denotes the top portion or section, and 2 indicates the under portion or section, of my improved surfboard, preferably made of papier-mch or other suitable material cast in sections or formed in molds, as illustrated upon Fig. 2 of the drawings, and the sections securely fastened or riveted together, preferably by means of papier-mch pins 3, nails, or other equivalent devices, as shown upon Figs. 1 and 3 of the drawings. The top portion or upper section 1 is cast or molded with the half-cleats or braces 6-6, and the under portion or section 2 is formed or molded in like manner integrally with the half-cleats or braces 5-5, as illustrated upon Figs. 1 and 2 of the drawings. I preferably cast, mold, or make integrally with the top or upper section of the board the downwardly-extending flange 7, which extends around the same, and in like manner will be readily apparent without requiring a more extended explanation. Various changes in the form, proportion, and minor details of construction may be resorted to without departing from the principle or sacrificing any of the advantages of this invention, and I therefore reserve to myself the right to make such changes as fairly fall within the scope thereof. Having described my invention, what I claim, and desire to secure by Letters Patent, 1906. 1. A pneumatic surf-board provided with sections having half-cleats or braces, half flanges extending around said sections and means for securing the said sections together. 2. A surf-board consisting of curved sections having half-cleats or braces made integral with said sections, said sections provided with flanges extending around the sections, the said sections, cleats or braces and flanges forming air and water tight compartments and means for securing said sections together. 3. A pneumatic surf-board provided with an upper portion or section having cleats or braces and a downwardly-extending flange surrounding said portion or section, an under portion or section having cleats or braces and an upwardly-extending flange surrounding said under portion or section and means for connecting the said portions or sections together. 4. A pneumatic surf-board provided with IOO an upper portion or section having half-cleats or braces and a downwardly-extending vhalfange surrounding said portion or section, an under portion or section having half-cleats-or I braces and an upward1y-extending flange surrounding said under portion or section, the said portions or sections, the cleats or braces and the angles surrounding the sections forming separate air and water tight compartments, and means for securing the said sections, cleats or braces and angles together. In testimony whereof I have signed my name to `this specification in the presence of two subscribing witnesses. W. J. BRYANT, J. GAUSS. Albert S.Johnston, Los Angeles, Cal. Geoff Cater (2017) : Albert S.Johnston : Pneumatic Surf-Board Patent, 1906.